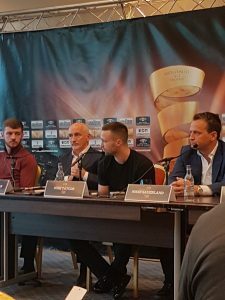 The World Boxing Super Series rolled into Glasgow today for a press conference ahead of their November 3rd show at the SSE Hydro Arena. However all eyes today were on a boxer, in which Scottish hopes of another world champion rest on, Prestonpans Josh Taylor. Taylor (13-0, 11 KO’s) takes on American Ryan Martin (22-0, 12 KO’s) in a quarter final tie, with Taylor defending his WBC Silver Super Lightweight Title. Taylor will be returning to a familiar venue having fought his last two fights at the Hydro, beating Winston Campos by 3rd round TKO in March and then an unanimous decision over former world champion Viktor Postol in June. Taylor also won gold at the Commonwealth Games held in Glasgow in 2014 as an amateur. When asked about appearing at the Hydro Taylor said, “Its brilliant, I feel the Hydro is now my home, I’ve had such great success there since 2014. What does Taylor expect to face from Martin? “I’ve only seen bits and bobs of him, I’ve studied enough of him to know what I need to watch for. “I know he’s a very well rounded fighter, got fast hands, good defensively. Good variation of punches and knows his way around the ring. He’s obviously got power as well although his record doesn’t say, only got 12 stoppages in his 22 wins. Taylor continued to say how he feels great in training and more settled. “The way I’ve been performing in the gym, I’m more settled now, got myself my own place down in London. So I’m settled, happy and I’m firing in the gym. Taylor went on to say how he feels invincible fighting in front of his own fans. “I think it’s brilliant, I don’t think there is anybody that will beat me in front of those fans at the Hydro. There are a host of quality Super Lightweight fighters in the tournament, Regis Prograis, former world champion Terry Flanagan and WBA champion Kiryl Relikh. Does Taylor fear any of them? “I’m not really fussed about any of the opposition. I feel I can beat every single one of them that’s in this competition. With the World Boxing Super Series being a tournament, Taylor already knows who he could face in the semi finals should he over come Martin. He will face the winner of Ivan Baranchyk v Anthony Yigit who are fighting for the vacant IBF world championship. Does Taylor have a preference? “I don’t care. I think Baranchyk will probably get through that and if so I’m confident I can win that. With all indications pointing to a packed Hydro Arena backing Taylor, few would bet against him beating Martin and making it to the semi final for a chance at his first world title shot. The hopes of Scotland rest on his shoulders to add another world champion to a list that includes Benny Lynch, Ricky Burns, Jim Watt and Ken Buchanan.